I’m attending the Thrive Conference in Sacramento where evangelical prodigal ex-pastor Mark Driscoll made a surprise appearance and lecture this morning. It was announced last night, but that was the first any of as had heard about it. Most of the lecture was about the persecution his family had experienced in the last year. He also gave several practical reasons why we ought to forgive people. But there was a gaping hole in what he had to say. Pastor Ray Johnston of Bayside Church, which hosts Thrive, introduced Driscoll, saying that back stage Driscoll was humble and apologetic. He said that this is the kind of guy he really wants to be in the foxhole with. “I really just like this guy,” he said. It’s harder when you have a family. Jeremiah, Paul, and Jesus were single. It’s scary what to think what would have happened to their families. If you are a shepherd that has been struck, you can’t talk about it in detail, because that would be gossip. I don’t want to talk about me. i want to sever you. We had an 8 year conflict that finally went public. Here he recommended 1st Peter 3:8-12 for such conflicts. He then began to talk about “Grace and I,” and he said that he used to refer to her as a pastor’s wife, but now he has to refer to her as an ex-pastor’s wife because he is an ex-pastor. They have 5 kids. The last year has been difficult on them. They’ve had to move three times for safety issues. There were protests outside their home, and a person who sounded mentally ill showed up at their house and was arrested. People would post his address online after he moved. Someone went to the bathroom on his front porch, and he received hate mail. At one point the media blocked the driveway to get an interview and a helicopter one flew over “to flush me out.” He said they went inside and avoided being in front of a window. He said his 8 year old came into the room wearing a military jacket and carrying an Airsoft gun and asked if the jacket was bulletproof. He hadn’t realized the helicopter was the media and had only seen movies where the bad guys came out of helicopters and shot everyone. The boy had night terrors for months. At one point they wanted to sleep in a tent in the backyard, but someone started throwing rocks over the fence at his kids at 6:30 in the morning. They filed a police report. Another time someone scattered a bucket of nails all over the driveway. He said his email had been hacked. He said God spoke to he and his wife “audibly” and released them from ministry. Addressing the crowd he said, “I’m jealous for the well-being of your families.” So he said he was going to be a dad and a pastor. He taught them about forgiveness. He said he didn’t want to raise kids who are bitter. So he wanted them to forgive those involved. He had seen the church picketed by people that he had baptized. But we forgive because we’re forgiven. We need to think about all of the malice brought against the chief shepherd. We have a broken-hearted God. Rather than vengeance, God had a plan, that Jesus would come so we could be forgiven and reconciled. He had Judas and Thomas and Peter. And he was destroyed in front of his own mother and brothers. It destroyed a family and that’s what happens when a shepherd is struck. He had wine vinegar in a sponge forced in his mouth, and his research has told him that this was what Roman soldiers used as an antiseptic after using the bathroom, like a kind of toilet paper. That’s what Jesus went through. When sin happens, someone has to pay. Vengeance makes for great movies (especially starring Liam Neeson), but terrible ministry. So he wanted to give us some compelling reasons why we need to forgive. Then he prayed that God would bring to mind someone that we needed to forgive. Exodus 34, about being slow to anger, is the passage that is most quoted within the Bible. And the best way to glorify God is to forgive. We are to forgive as Christ forgave us. We’re not denying justice, we’re just handing it off to the highest court. 2. Because I love you and forgiveness blesses you. It releases stress and depression. Not forgiving “makes your worst day your every day.” It benefits you physically to forgive in terms of stress and sleep, and emotionally in terms of healing and letting joy return. He did a brief excursus on the parable of the person who wouldn’t forgive and then had to go to the jailer, who Driscoll said was Satan. We say that they need to repent to be forgiven (at this point Driscoll made the point by yelling), but, he said quietly, they don’t hold the key to the prison. We do. And we open the door when we forgive. 3. You bless others when you forgive. Jesus said to love your enemy, which is how we know the Bible was not written by human beings. To not forgive someone is to take the seat of God. 4. I believe God gave this message to me. I’ve done 6 months of study on forgiveness. I don’t want to say that I’m totally innocent. Sometimes the shepherd is wounded because he punched himself in the head. But forgiveness is always tied to the demonic. Forgiveness is how we were delivered from the demonic. In your anger do not sin an give the enemy a foothold. Satan and the demons have never been forgiven for anything and they will never forgive anything. So when you refuse to forgive, you are trafficking in the demonic. Bitterness grows and can take hold and defile many. But I want joy and grace to flow in your life. So forgive them. Then he closed in prayer. Johnston came in and prayed for Driscoll and alluded to God doing something new in and for Driscoll. It sounded like the forecast of a professional return. As I say, that’s a rough paraphrase, but I think I’ve got the gist of the content. Now here’s the one lingering issue I have. Driscoll just gave a long lecture on forgiveness without asking for it. Aside from the allusion to “not being totally innocent,” he really didn’t point out his own failings. In fact, it seemed like the entire lecture was aimed at his need to forgive those people who had wronged him. What has happened to his family is horrible, as he describes it, and should never happen. But what lingers after Driscoll’s resignation is that he evaded his Board’s plan for a disciplinary procedure. He never really reconciled with those whom he had harmed, and after all of his talk of forgiveness, it would have been so simple and so graceful for him to ask for it. Perhaps that was to be the implication that was to be drawn from the whole talk – that Driscoll now needs forgiveness too. But the weight of the graphic imagery of the abuse of his family left us with the undoubted impression that Driscoll was a victim who now needed to forgive those who had wronged him. He was a “struck shepherd” that heaven had taken out. I think his idea that Jesus’ goal is to gather people around the pastor is symptomatic of Driscoll’s issues. And if this is indeed a step in the direction of a professional re-emergence, I think most of us still want him to address the many charges and challenges that have been brought against him. He has certainly apologized for much of it, but I think any professional return on his part will require that those issues go addressed through a supervised process. There are still many people who have been reportedly hurt, bullied, and fired from their jobs by Driscoll, and I think his read on forgiveness may have to more thoroughly include himself among the guilty if he wants to regain any kind of credibility. But just to provoke the seething hoards who still hate Driscoll, let me say something that I’ve said before – he’s a brilliant orator. There are few communicators like him, and in the right place, with humility and supervision, he could live a life of effective ministry for Jesus. Those Christians who still want to disagree might want to think about who the Apostle Paul really was. And honestly, we might want to think about whether or not we really do believe in forgiveness. Because no one is beyond it’s reach, and Jesus did give us a heads up that we will be judged in the same way we judge. To hate Driscoll is to reject grace. This was my initial dream for Driscoll when he resigned. So my question is how many of you who have been criticizing the Mars Hill actually attend the church? Great things came from MD and the church. I think too often the negatives out wieght the positives…even though there may be more positives. Using Paul as a point of reference is not an accurate comparison. When Paul committed his harmful acts he wasn’t a Christian yet. Driscoll intentionally harmed and deceived people while assuming the role of a Christian pastor. I am often concerned whenever ministers are reinstated after committing egregious offences. I am even more troubled when we’re told that forgiveness and reinstatement of the pastor is the “Godly thing” to do. The issue of forgiveness is quite complex and cannot be so easily understood as a cycle of sin, repentance, forgiveness, and reinstatement. To my awareness, while this dynamics of sin/reinstatement does appear in certain scripture passages, it is not to be seen as a blanket statement for all circumstances. In the case of adultery, scripture is clear that full reinstatement of the marriage covenant is not required. While there is compelling reasons for the victimized spouse to forgive the offending spouse, there is no compelling reason that the victimized spouse must continue with the marriage once such a hurtful act has been committed. The act of forgiveness and the act of reinstatement must not be viewed as forever bound together. Much more thought must be done in the area of what happens after forgiveness than simply stating that things have to return to what it was. In some circumstances, how things were can never be again. I would argue vehemently that while pastors who commits egregious sins should be forgiven when they properly repent, they should be permanently disqualified from their post as leaders. In the case of youth pastors who are guilty of illegal sexual activity with the youths they were supposed to protect, I can see no reason why such persons should ever be reinstated as a pastor again irrespective of how much repenting they do. While such persons, after displaying repentance, can and should be reinvited into the church body, full reinstatement of the authority of a pastor must never be seen as the natural course to what follows. That Driscoll is an effective communicator should not be used as a reason for his reinstatement. God gave him the opportunity to serve others and Driscoll abused it. God will raise up other effective communicators. When the supply of effective communicators are insufficient, God can raise up folks like Moses, who had a speech impediment, to continue leading his people. Thank you so much for your response to this post. I too hope that you share your exact response (and maybe more!) to the leadership/organizers at the Thrive conference. I also would love to have you share it with the Hillsong leadership, and as an op-ed in the Seattle papers/media. I live in the Seattle area and know many who have been harmed/abused by his teaching over the years and the way he left Mars Hill. Thank you so much for sharing part of your story. Thank you Pastor Miller as well for your post. I was shocked…dismayed…horrified at his appearance and speech at this conference so I was thankful to read your post and ex Marshiller’s response. Thank you so much for your response to this post. I too hope that you share your exact response (and maybe more!) to the leadership at the Thrive conference. I also would love to have you share it with the hillsong leadership, and as an op-ed in the Seattle papers/media. I live in the Seattle area and know many who have been harmed/abused by his teaching over the years and the way he left Mars Hill. Thank you so much for sharing part of your story. Thank you Pastor Miller as well for your post. I was shocked…dismayed…horrified at his appearance and speech at this conference so I was thankful to read your post and ex Marshiller’s response. I see there are some haters of Mark Driscoll, but what many don’t see are truths about his detractors who may have injustly kicked him out. They have truly hurt the church and have removed Mark without thinking about the repercussions. Yes, Mark might have a personality that clashes with others, but as in any church, there are are also some lay-leaders who like to cause trouble through manipulation, and are hungry for power and control. When sheep attack, they attack without mercy and can target pastors when the time is right. Why? because they have also been deceived by Satan. Mark does admit his sinfulness as a human being. I think t takes a person of humility and who understands the good news about Christ’s forgiveness to say such things about their own sinfulness. But I haven’t heard his detractors and critics admit their own sinfulness. Mark does understand the gospel. It seems like those who deride him do not yet understand nor practice the good news about God’s forgiveness because they are hiding behind their own self-righteousness. Many in the church who like to point fingers at Mark and other pastors who have been unjustly struck may turn up as the real hypocrites in this whole thing. There are always the other side of the pastor’s story that often goes unheard because they don’t want to gossip and slander. I think this is what Pastor Mark is likely going through. We should pray for him and his family. We should pray for his restoration into ministry. God has called him and gifted him for ministry. Kevin, no one “removed” Mark or “kicked him out”. He chose to leave rather than agree to a process of restoration. This process was being set up by the very men Mark often held up before us as those who were there for the purpose of holding him accountable. Yet when they attempted to do this, Mark (the fatherly figure who loved us all so much) walked away. This was not lay-leaders taking this action. This was elders and others who held office in the church. (It was also not lay-leaders who brought the formal charges which were finally treated as the bylaws of the church required. It was not lay-leaders, but nine current elders who wrote their letter stating their concerns last August. Do you think they were lying?) These men, charged with holding Mark accountable, stated that Mark had a number of persistent sins in his life. They stopped short of saying he was disqualified as an elder, but if you compare their list of Mark’s persistent sins with the apostle Paul’s lists of disqualifying sins in 1 Tim 3 and Titus 1, you will find them all there. Paul (and Jesus) were not okay with leaders in the church living a lifestyle in persistent sin. We should not be either. This is not a matter of hate or unforgiveness. I do not hate Mark. I continue to pray for him regularly. We are all sinners saved by grace, but church leaders (by God’s Word) are held to a higher standard. I speak up, not from a heart of unforgiveness, but for the purity of the Church and to defend against new victims, if Mark starts up as a church leader again without first dealing with his persistent and disqualifying sins. As an attendee of the thrive conference and hearer of the message live the responses to the event are interesting to me. The response is the demanding that he ask for forgiveness for his transgressions. Yet that misses the very point of what forgiveness is about. Forgiveness is not for the offender to admit their failure. Forgiveness is for the offended to be freed of the hurt or anger that leads to bitterness. Mark was not trying to place blame on others he was pointing out his need to not fall into the trap of bitterness cause by the lack of his choice to remain hurt (though he clearly is still hurting) or angry (which he never expressed towards any one in this event). I took it as a man who admitted he was flawed, sharing where he was at in his journey to not become angry and bitter. I did not stand as I clapped at the end of his message. I prayed for him! I am not excusing what he did. I’m forgiving him. I am not defending what he did. I was not there. I only know that restoration and forgiveness are not synonymous forgiveness is personal and only requires me and is for me. Restoration require both to forgive before that process can begin. All who have been hurt, all who are outside observers of Mars Hill. Are you forgiven? Can you forgive? It does not require an admission of the others guilt for us to forgive. Aaron, I think the question you raise is often the straw man that misdirects the discussion about Mark and Mars Hill. Before one can ask to be forgiven, he has to first acknowledge his sin. Mark has made vague references to sin in his life, but he has never admitted sin in the basic way he ran Mars Hill, misappropriating church funds and leaving “a pile of dead bodies” behind him. Mark taught clearly about repentance and reconciliation. He would never have given a free pass to someone at MH who walked away in the middle of church discipline. That’s in essence what Mark did, rather than deal with the persistent sin in his life. I do not speak out from an unforgiving heart. I speak out for the purity of Christ’s church. We are called to hold leaders to a higher standard. Where is the evidence of repentance in Mark’s life? He has established a new ministry and is seeking to continue to be a leader in the Church. (And he is being given that status when he is put on stage and is given a standing ovation by leaders in the Church.) It is not loving to Mark (or what scripture calls us to) nor loving toward those who will likely become his new victims to allow Mark to continue in his sin. After having read numerous comments by MD addressing his situation, as well as his comments from this conference, an apology from him at this time for his past behavior is not warranted as it would be disingenuous. This young Nebuchadnezzar needs to spend several more years eating grass with the beasts of the field to develop the proper humility to recognize the gravity of his past transgression(s). As I have read numerous comments about MDs need to apologize as a part of being restored, at this point it would appear to be to late for that action to have any credibility. Perhaps some time in a field eating grass like an ox will develop the right type of attitude towards God that he requires. I think we ought to forgive but to also remember being a shepherd is a high calling and teachers are held to a higher standard. Yes we should forgive when he asks and acknowledges his wrongdoings but that doesn’t mean there shouldn’t be consequences for those actions… like not being a leader of a flock. (At least in my humble opinion). James, have you thought of writing Ray and sharing these same thoughts in a letter? Full audio of the “sermon” if you are looking for it. Thanks for this, James. I appreciate your grounded summation of that conference. I’m dismayed that pastors still want to help Driscoll reach that masses, and that they are affirming him by doing so. I am dismayed that Hillsong had booked him for their conferences in London and Sydney and now have sidelined him to an interview but have not deleted him from the program. I agree that the issue is that he is posing as a wounded warrior who has done little to bring upon himself the outrage that he now walks in with his family. I have been a pastor for more than 30 years and I know that there are times when people can turn on you, and it’s tough, but he has been a leader of war for all of his ministry. Not for nothing is his church called Mars Hill. I would like to hear him ask forgiveness in a full and free way, without qualifying by talking about what has been done to him. I hope the guy fades from the ministry eye and gets a job as a salesman. He’ll be brilliant at it. Sporting goods, or guns or something manly enough to satisfy him. Thanks for your thoughts, Nathanael. I wasn’t meaning to paint all of the critics as seething hordes – rather, I was referring to the cross-section of people who really have capitalized on Driscoll’s obvious failures as an opportunity for mockery. I fully acknowledge that there is legitimate grounds for critique, as I’ve tried to present at least in a small way in my write up. And I certainly agree that character matters – I just don’t believe any of us are above God’s power to correct, change, and heal. All good wishes. Right on. In his world, apparently the victims have now become perps. He meanwhile is being enabled by friends and True Believers. How often is this the case in the new “Restoration Paradigm”. The original abuser become the victim of those who refuse to forgive! But how can they forgive unless the first party confesses, one by one by one. That does not seem to be the case in this case. He has always seemed to me to be a sort of ‘the ends justify the means’ of person – the ends of making Mars Hill huge justified the means of paying a company 1/4 million of the church’s tithe money to buy hundreds of copies of his marriage book so that he would end up on the best seller list and do interviews on public television to tell people about Jesus. In which case, he is more sorry about having been caught than he is about the things that he did. Having been caught means that he cannot do as much for Christ (the ends) and has fewer resources (the means) with which to do things. Even in your description of his thinking is still evident: the ends (resolution) justifies the means (continued preaching even without having humbled himself) as he still sees himself as not very guilty, only slightly and it’s everyone else that must forgive him rather than him forgiving himself for how his actions hurt others. He didn’t care that calling a co-worker in Christ ‘fat’ hurt him (the means) since it justifies (the ends of) the other man’s moral improvement according to Driscoll’s point of view. And that’s why I’m not his fan, With him being on the preaching circuit, I don’t think he’s really ready to teach other people when he has not learned his own lesson. You don’t know me and I don’t know you. I doubt we will ever cross paths. I’m no one famous, just your average Christian living in Seattle. My spouse and I were members at Mars Hill for over a decade before we left in 2014. We were both deacons, serving and tithing regularly. We didn’t know Driscoll personally, but occasionally interacted with him. We optimistically believed and hoped the best in him and in our church for years and years. Call us naive, but we really did think that the conflict and rumors swirling around him were from “haters” and those who wanted to destroy his ministry. He kept repeating, “It’s all about Jesus!” and we took him at his word. Driscoll is a gifted speaker and incredibly entertaining. It was easy to attend on Sundays and he could keep our attention for his hour long sermons. While there were occasional things he said that we didn’t agree with, the vast majority of his sermons gave lip service to Scripture and decent theology. About five years ago, he preached the best sermon I’ve ever heard on Forgiveness, Repentance, & Reconciliation. It was transformational for me. I remember thinking how thankful I was to have a pastor that understood how to handle conflict in a godly manner. Of course, these were back in the days when the internal strife and bullying by Driscoll towards his elders/staff were closely kept secrets. Even as the issues began to come into the public eye in early 2014, we held out hope that Driscoll would apologize and make things right with those he’d hurt. Because that’s what godly pastors do, right? It was devastating to realize that our pastor was actually an angry, domineering tyrant who would rather paint himself as a victim than apologize. Sure, he talks a good game with sermons on forgiveness and repentance. But he won’t actually let the words “I’m sorry for __” pass his lips to the person he’s hurt. You wrote “He has certainly apologized for much of it…” Really? When/where? I ask that genuinely. I am not aware of Driscoll actually apologizing. I’ve been waiting and hoping to hear an apology from him 1. to the former elders he hurt & 2. to the church body he destroyed because of his foolish lack of repentance. Driscoll often vaguely references “Oh, I apologized” in public statements or in sermons. But I can’t actually find video or audio or written evidence of him apologizing for anything. Regarding his need to apologize, Driscoll loves to claim that his critics are anonymous and therefore he cannot find them to apologize. Not true. There have been dozens of his former elders who have publicly come forward about the abuse they endured at his hands. There were the 21 former elders that filed the formal charges against him (that led to the investigation by the BOAA and his eventual resignation). You can read about those formal charges here, if you haven’t seen them. http://www.patheos.com/blogs/warrenthrockmorton/2014/08/21/former-mars-hill-church-pastors-bring-formal-charges-against-mark-driscoll/ I know many of those 21 former elders personally. Driscoll was friends with all of them at one point, so it’s not like he doesn’t have their cell phone numbers and email addresses if he wanted to reach out. These men are the real pastors of Mars Hill- the ones who actually shepherded the flock. I’m not aware of Driscoll apologizing or repenting to any of these men and their families. It seems like that would be a good place to start, wouldn’t you agree? I don’t expect a personal apology from him. Driscoll wouldn’t know who I am. But he could still write a letter or blog or post a video on his website to apologize for failing his flock. He let his sin consume him, treated others cruelly, and God removed the lampstand Mars Hill. I hope that some day he faces these facts and apologizes to the thousands of us he hurt, his former flock. For the year or so before he resigned, Driscoll kept referring to himself as our spiritual father. I wish he’d act like one instead of being just another lying, hypocritical, deadbeat dad to his sheep. … And so forth and so on. Many incomplete and half true statements to make him seem like he’s being persecuted. It’s really remarkable that he’s managed to paint all of this with himself as a victim. Driscoll is quite proud of practicing what he called “riot evangelism.” In other words, there is so such thing as bad press because it “gets Jesus’ name out there!” He regularly engages in controversial behavior solely to garner attention, positive or negative. He isn’t concerned for the safety of his family when he is tweeting offensive statements or trying to bait people into arguments. He only claims concern for his children’s well-being when it benefits him to play the victim. It should go without saying that Driscoll’s riot evangelism isn’t godly behavior for any Christian, much less a pastor. 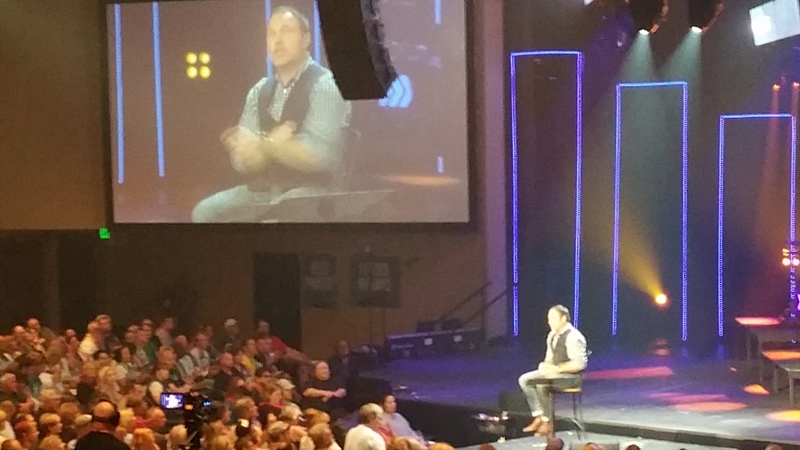 To learn that Thrive 2015 gave Driscoll a microphone today… that HURTS. I followed the tweets and Instagram pictures and blog posts from the conference attenders today. I was hoping against all logic that Driscoll would begin his work of repenting at Thrive. He didn’t, which brought back the devastation I felt from the Mars Hill meltdown all over again. And then to see all of the positive remarks from naive conference attenders who are buying his song and dance? Another layer of spiritual pain and soul crushing. There are so many of us in Seattle who would love to see Driscoll make things right and begin to apologize to those he’s directly hurt. But he hasn’t. He just wants to paint himself as a victim and keep being a Christian celebrity. I don’t hate Driscoll. I’m not part of the “seething hoard” you refer to. I agree with your final point- no one is beyond Jesus’ reach! I hope to one day see Driscoll repent and change. I’m just very, very sobered and sad by what happened at Mars Hill and the broken state of Christianity in Seattle. Driscoll’s true legacy is all of the spiritual devastation he’s left behind in this city. Thank you, James, for being the one voice I heard from the conference acknowledging there was something missing from Driscoll’s speech today. You’ve restored a bit of my faith in pastors. Thank you ex MarsHiller for your spot on comment. As an ex Mars Hill member myself, I can attest that you have presented an accurate and clear accounting of the real history of what happened. Good thoughts. I may be wrong in attributing too many apologies to him. The first time I heard him speak publicly was at a conference where he brought different speakers out and explicitly apologized for the way he and his “tribe” had polarized against them. Given that I didn’t have a lot of the background story at that point, I had the impression he was trying to make amends. Of course, I could be wrong. I certainly would appreciate more explicit ownership of the failures on his part. Thanks for stopping to say something. holy moly! I was there at the conference and had to walk out after about 20 minutes. That was AFTER 1/2 the conference gave him a standing ovation as he came out on stage. He did say all those things and completely made it sounds like they all just happened this last year. Bayside lost any and all credibility by giving this abuser a stage to deceive even more people. Great thoughts… yes, he has not apologized… he admitted in vague passing that he made some mistakes, but he didn’t specify what those were. He has never once admitted to sin. Never once has he reached out to apologize to anyone he hurt. Never once has he said he will try correct his behavior through the grace of God. saying you made a mistake is getting a parking ticket, in the face of his atrocities that a bandaid on decapitation. ex MarsHiller, thanks for sharing what must be a painful journey, you are absolutely right on all the points you bring up. Mark has only apologized for being caught, not for any of the problems he brought to Mars Hill. The stories he shared are not that shocking, nails on the driveway have wounded few people, and they could have been simply dropped there by the construction crew that put in his $50K deck. If that is the only things that has happened to him in 13 years, he should move to California, he just described a month of living in LA. Have you considered writing a letter the organizers of the Thrive conference? Your post is so hearfelt you could just cut and paste what you wrote. James you hit it on the head of the nail. Mark needs to admit his faults and appoligize to those he hurt. You have shedded more light to those stories i have heard over and over too. I pray that he gets right with Jesus and the people he hurt before he is allowed a platform again. Wow! Wow! Wow! Thank you for sharing this with us. I think your `take’ on the entire dramatic event was spot on. When the “mighty are fallen,” they are super-sensitive to the persecution, vengeance, and injustice to which they rightly or wrongly are subjected–and indeed it is tragic beyond words–use that inexcusable abuse to win sympathy for themselves by parading how magnanimous they are in their response to their persecutors. And if they can wrap themselves in the robes of `Jesus talk,’ so much the better. What they seem totally blind to is the long trail of hurt, anguish, damaged friendships, endangered families, and destroyed faith in the church that they created when they were riding high as the `mighty.’ It would have been nice if there had been at least a echo of Psalm 51 where King David’s confesses his sin–not the sins of his opponents–and puts the blame for his fall not on his enemies but squarely upon himself. Thus for Driscoll a huge opportunity for at least the beginning of genuine reconciliation and restoration squandered. He still doesn’t get it.